How one of the world’s smallest countries is producing some of our most important inventions. Tiny Dynamo is an inspiring collection of 21 easy-to-read stories about Israeli inventions that are changing the world. Each story details the inventor, how they came up with their idea, the challenges they faced, and how with determination they turned them into reality. There are inventions you might know about–like the Flash Drive or the tiny PillCam, a one-inch pill you swallow that takes an 8-hour video of your insides–but you will discover new ones, like the Biodegradable Food Packaging created by a Israeli computer engineer mom tired of recycling all the time; or the scientist whose young son asked him while watching Disney why people can’t breathe under water like fish can, so he invented Like-a-Fish, a mechanism that eliminates unwieldy oxygen tanks. So often what you read about Israel is war and hostile neighbors, but Tiny Dynamo gives you another perspective–a positive can-do society where ordinary citizens are inventing extraordinary things. 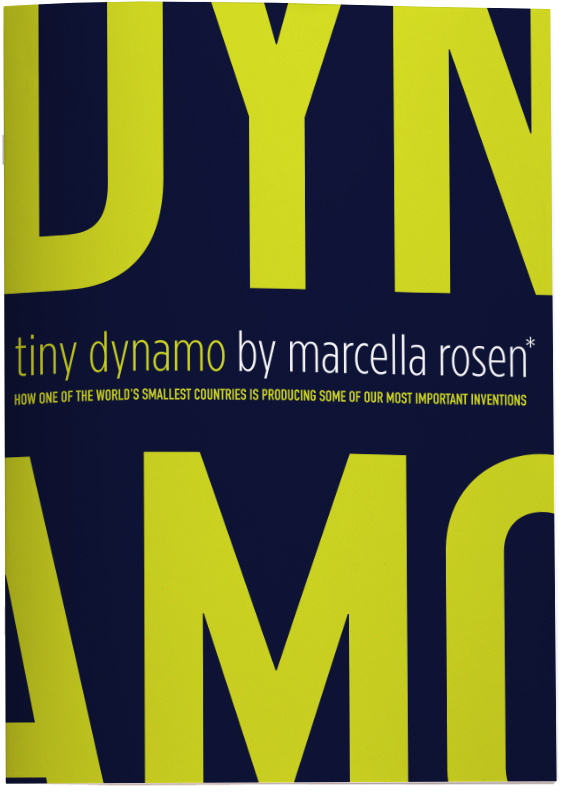 Whether you are an entrepreneur, interested in medicine or technology, a fan of Israeli innovation, or just want to dip into some great short stories, you will find Tiny Dynamo a compelling read.